If you haven’t been sprayed yet by the rhetoric coming out of the Republican primary showdown in Ohio House District 85, look alive. Collateral damage won’t be confined to Champaign, Logan, and Shelby Counties. Our leaders should be above reproach–in morals and in messaging. These attacks are the very essence of desperation and dishonor. That they fly the banner of a family court judge–an applier of the law regarding society’s most vital institution–is saddening and disturbing. At least his honor the judge has provided us, for the benefit of our instruction, with Exhibit A of some of the worst-ever messaging from a self-described conservative. “Vitale said that the U.S. is becoming a ‘fatherless society.’ Surprisingly he agreed with a quote from [then-Senator] Barack Obama that fatherlessness is a direct cause of addictions and crimes that plague society. To those (such as myself) who heard Mr. Vitale’s remarks in person–not merely in context but in bonafide grammatical clauses and sentences–it is clear why Mr. Chamberlain needed a Tommy gun’s worth of ellipses for this hit job. Objection, Your Honor. Ohio is on hard times when a family court judge–who at the forum highlighted his own role in many times signing papers to remove children from parental custody–misinterprets a call for fathers to lead their families as an opportunity to smear a fellow family man to score cheap points in the Republican primary. Vitale was only echoing the very point that the Heritage Foundation routinely makes when defending natural marriage policy: that even Barack Obama once understood the importance of fathers and the crisis of marital and family breakdown. Does Doug Chamberlain? A second mailer by Mr. Chamberlain attempts to exploit Mr. Vitale’s boyhood circumstances, utterly beyond his control, which have led to him having more than one last name over the course of his lifetime. Stars, hide your fires! Yet the judge would have voters ignorantly conclude from such “evidence” that Mr. Vitale is a shapeshifter. One wonders how many shapeshifters–citizens whose names have changed because of parents’ remarriage, or adoption, or immigration–fill Champaign, Logan, and Shelby Counties–and whether the judge holds it against them. Objection, Your Honor. Surely something is rotten in the state of Ohio: Judge Chamberlain’s messaging, and the skewed moral compass directing it. It is precisely these kinds of gaffes that help us see how pernicious we conservatives can be when we fail to address even a single issue, statement, or fragment of substance when we “contribute” to the marketplace of ideas. Perhaps our “leaders”–may we cease to follow them–resort to cheap tactics because they know they cannot compete in this marketplace. Rather than serve the public by taking their high-cost, low-value leadership off the shelf, however, they resort to preying upon–or in this case, cultivating–citizen ignorance to fleece the electorate. As to Mr. Chamberlain’s own market value to the electorate: one need not gut his remarks of their true meaning to walk away with sticker shock. When asked at the March 10 forum for thoughts on fixing Ohio’s broken education system, for instance, the judge’s protracted response failed to articulate a single solution, while dismissing “charter schools” as “a failure in Ohio.” This should not surprise us since Mr. Chamberlain also failed to come out swinging for a single free-market principle all evening, in contrast to the other candidates. Also sparse were remarks from the judge on family values. Perhaps Mr. Vitale can point him toward a quotation or two. 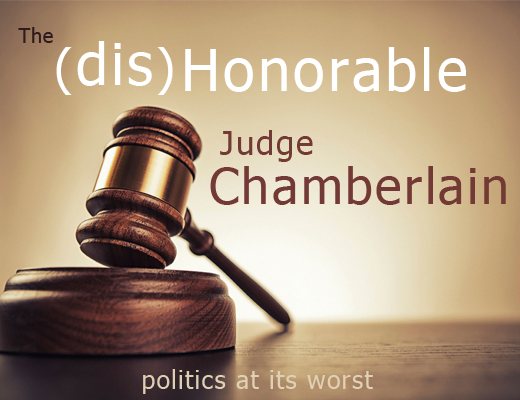 Judge Chamberlain should tell the truth, the whole truth, and nothing but the truth. If we cannot trust him on the campaign trail, we cannot trust him in Columbus. Here is one vote for his recusal. Michael Hamilton is the Executive Director of the Conservative Republican Leadership Committee and the Executive Editor of Ohio Conservative Review.